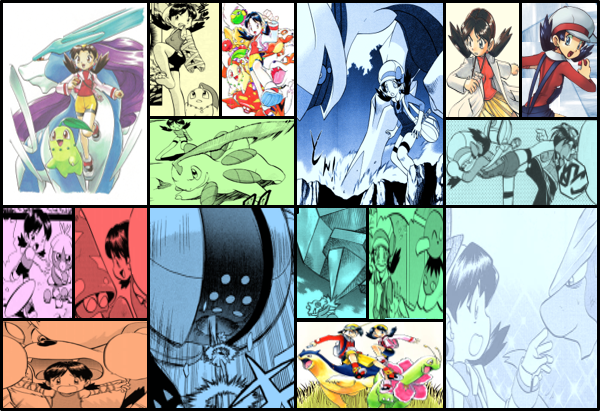 Discussion in 'Pokémon Manga Discussion' started by shoz999, Nov 22, 2018. So I don't think it's that far off that Pokemon Adventures have arguably the best takes on the villains from the games. For some fans, some of the takes are even better than GameFreak's version. I suppose it has to do with the fact that these villains have their own character progression, you could say that they are going on their own Pokemon journeys hidden behind the scenes, making every step to their plan count, thinking if what they are doing is right or wrong or in some cases absolutely right to the point of insanity and selfishness. Sometimes at the end of their Pokemon journey, the villain actually wins, some are far more interested in a different path than the villainous path that GameFreak originally planned for them and for others they face a very ironic fate shocking readers and the fictional characters themselves. Regardless I feel like villains are a key-factor into why some people love Pokemon Adventures. So what are your favorite villains and explain why. Sird. By far the most complex and ambiguous character in any Pokémon series. I absolutely love her, from her unexplained and mysterious capture of Darkrai to her multiple appearances as a driving force behind the conflict of not one, not two, but THREE different and unrelated arcs (FRLG, Emerald, DP), her reappearance at the Spear Pillar remains one of my absolute favorite moments in Spe, that ties together so much that seemed unrelated, and yet... it just all makes sense... Kusaka spent so long setting up her reveal and character as a whole, and it just plays out in the greatest twist in Spe. Also, I remember just thinking how awesome it was that she could do something like petrify those five Dex Holders, five of the most powerful trainers in the world, like it was nothing, not knowing about Darkrai since I hadn’t read DP yet, it just blew my mind! BenLee really not taken, shoz999 and Redstar45 like this. Actually i wanted to use sird to battle against ash and his friend in my story because she like remind me of hunter J from the Pokemon anime dppt arc . And i wish frlg arcs is longer than it is actually is and i wish Giovanni was dead in rgby arc so we can get this arc about her instead of him . Don't know about that. We have Pryce and Lance who stand out pretty well as villains, especially Pryce. Although you could say Sird is Kusaka's own villain, she is technically a TCG creation, not an original one. What Sird has in common with Pryce and Lance is that all three of them have original villainous backstories, the same can also be said for Kusaka's take on Archie and Maxie, whose game versions really didn't get a proper reason for their villainous motives until ORAS. You can tell how GameFreak didn't really think much for Archie and Maxie at first by their anime adaptations not really having much character. Kusaka had to actually give the two more character depth than the games offered. This is why the anime and manga versions are so different from the ORAS versions. I think lance should be him being a brainwashed by Agatha who wanted kill oak family and anyone who is with his family at yellow arc .and him joining dex owners in fight against Masked Man during the event of the GSC Arcs . Okay but for now I feel we should judge these characters mostly for what the characters has and not what we wished they had. Any villain that particularly stood out for the qualities they had? Their character progression? Or perhaps someone that's still open for future storylines, like Sird, Ghetsis, Lusamine? I think sird is more interested then rest of team rockets even Giovanni as she like the Joker from Christopher Nolan batman film .....she have fun being villain then rest of the special villains and . I feel like Archie, especially as Guile Hideout, had a lot of fun as a villain who longed for the seas. I looked it up. Apparently there's another thread about favorite Pokemon Adventure villains in... 2012... huh... I'm honestly kind of surprised that the topic of Adventure villains isn't talked that much through the last six years. Although you could say Sird is Kusaka's own villain, she is technically a TCG creation, not an original one. Huh, I never heard about that before. Does the TCG have a story? Other than that, I guess my favorite villain is Giovanni. I have a fondness for the og Big Bad. 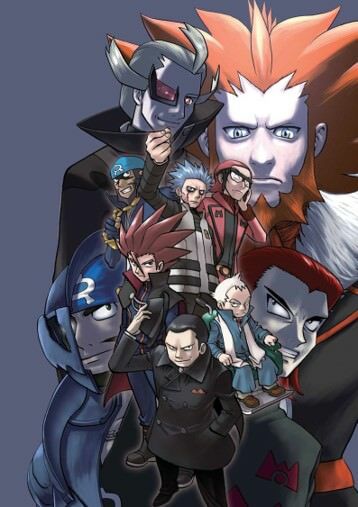 On a slightly different note, I find it very curious that Cyrus and Lysandre both had the plan to destroy and then rebuild anew. Could Sird have been lurking behind-the-scenes at Team Flare, whispering ideas to Lysandre? I can see Sird researching other villainous organizations behind-the-scenes whispering similar ideas to certain organizations, would add more to a possible cross-over between all 7 generations. 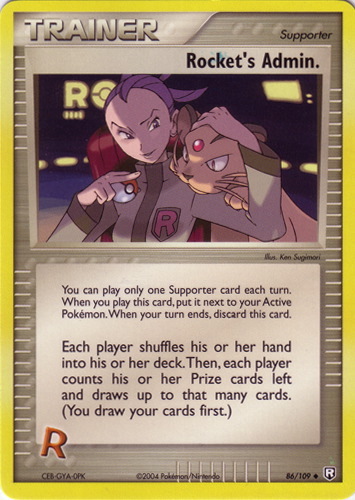 As for the TCG, here's the original "Sird" depicted in the Rocket's Admin card. What you may not know is that this isn't actually the first villainous reference to the TCG that Pokemon Adventures has done. In the original Pokemon Adventure RGB story arc, Red seeks Prof. Oak's help against Team Rocket only to be encountered by an Imposter Prof. Oak which is an illusion by Sabrina's Kadabra. This is actually a reference to a short series of Pokemon TCG cards based around the TCG-creation, Imposter Prof. Oak. Hey that imposter oak will be use in my story . Giovanni I guess since he has a cool personality and I like his role in FRLG.